Much of the success of the Foundation’s grantmaking program is because of the one guiding its efforts, Foundation Vice President for Programs Barb Szczepaniak, who recently celebrated 10 years with the Foundation. During those 10 years, Szczepaniak has facilitated 4,435 grants totaling more than $29 million – that’s 81% of the Foundation’s cumulative grants awarded. Besides directing various grant programs, Szczepaniak played a vital role in launching the financial fitness program, Bright & Early DuPage, and Arts DuPage initiatives, and is an active connector between the Foundation and the community around us. Barb was the 2012 West Suburban Philanthropic Network’s Grantmaker of the Year and a 2016 Woman of Distinction awarded by Suburban Living Magazine. Staff, Board Trustees, Grant Committee members, grant recipients, and – surprise! 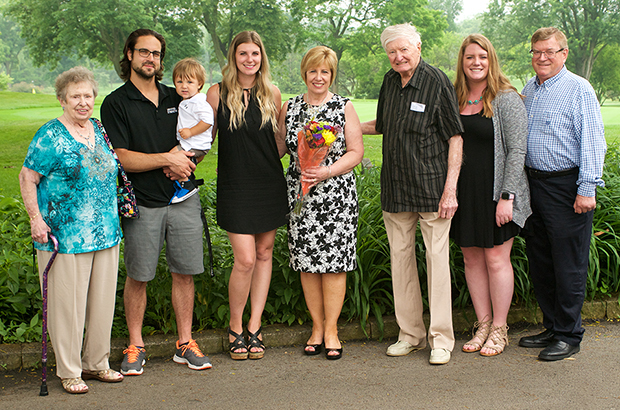 – Szczepaniaks’s family members recognized her milestone at the annual spring grant breakfast on June 12. Join us in congratulating Barb on a decade of excellent service to the Foundation!